This week is National Library Week. This year I can say that I not only frequent the library, I work in one. I worked in a library right after high school, and always wanted to get back to one. Goal finally achieved. I am a shelver at Taylorsville Library. I am really enjoying my coworkers and the library itself. And I come home with a lot of books. So it’s a good thing I work at a library, not a bookstore. It’s wonderful being surrounded with books, working with books. And I get to help people on a topic I am passionate about, not some generic customer service that drains me. Here are a few of my poems that express what the library means to me. no budget could sustain my obsession. Do I read an author tried and true? to fill the pages of my notebook. I was very pleased with my poetic productivity in April. Here’s the breakdown. I competed in daily challenges on the Sims 3 forums. These consisted of weekly themes, and daily styles/forms. Not all poems had to be newly written for the contest. Wrote 19 new poems, and entered all but one day. Won twelve days (half of those were ties). Earned 2600 points ($26 of Simpoints which I got in stuff for my game). 1332 words of poetry written. Compliments on my poems, as well as small gifts from other contestants. Four new Sims friends (fellow poets). Overall winner (most wins and points). Eight poems packed with potential that need polishing. I’m so glad I participated in the Sims 3 Forums rather than the Poetic Asides blog this year. It was much more intimate, and I think that helped to inspire me as the month went along. I also composed two Book Spine poems, one which I shared in my last post. The other is one I did for the library contest. Below is my poem showing what the library means to me. It was a finalist (top ten of over 100 entries). Doing the book spine poem at the library also had another benefit. See that bottom book? I grabbed it solely for the title. I glanced at the front cover blurb due to the butterfly. Went on instinct, and checked out the book. Read it in two days. LOVE. The book is HAVEN by Kristi Cook. It’s a YA about a girl with precognition, who transfers to a school where everyone has some sort of psychic ability. In the author’s own words: Think X-Men meets Twilight. Loved the characters, the fresh spin on the plot. Could not put the book down. Immediately checked out book two, MIRAGE. Now eagerly waiting for book three to come out (this fall!). To end the post, I will share with you one of the poems I wrote last month. A Villanelle. with words alone manipulating fate. a goddess, many worlds do I create. the dragon takes them out with just a bite. the princess freed to her own tale rewrite. If you’re not aware, April is National Poetry Month. Next week is also National Library Week. AtYourLibrary.org is celebrating both with a contest. Use the books from your library to compose a Book Spine Poem telling why the library matters to you (deadline April 20). 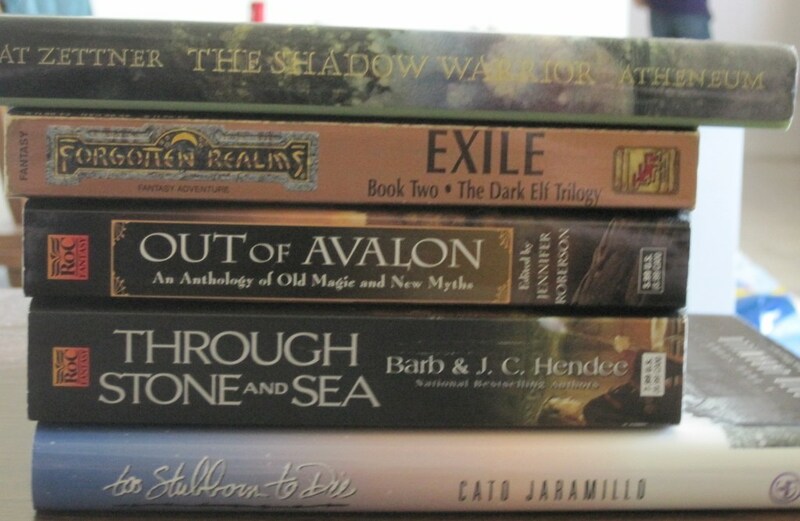 I haven’t made it out to my library yet, but wanted to make my own book spine poem. This isn’t themed about the library, and was made using my personal library. 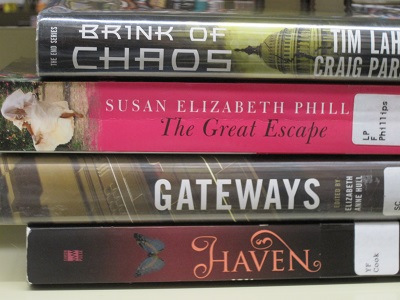 A book spine poem is made by stacking book spines so the titles make a free verse poem. It was a fun challenge going through all my books, pulling and mixing and shifting trying to find something I liked and that told a story. I’d lvoe to see what you come up with from your own libraries.